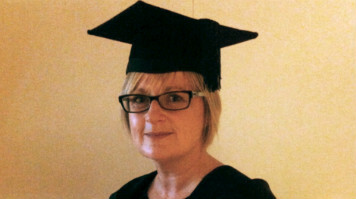 In recognition of her achievements on the course, Claire was awarded the prestigious British Psychology Society Prize (awarded to the highest achieving student on individual courses accredited by the Society), as well as the Course Director's Prize for Outstanding Achievement in Undergraduate Psychology. "Claire has all the key attributes of an excellent social scientist - she has an enquiring mind which is always seeking answers - and a firm grasp of the theory and practice of research", says Dr Daniel Frings, Programme Director for Psychology at LSBU. "When combined with the hard work and dedication she brings to bear on her academic studies, the result is one of the highest degree marks awarded by the department in a number of years. I am sure we will be seeing great things to come from Claire and we'll follow her career with interest." Joining LSBU as a mature student, Claire worked part-time as a Breast Care Nurse Specialist at Portsmouth Hospital's NHS Trust throughout her LSBU studies, and also sits on the North Hampshire Bench as a Justice of the Peace. Her final-year project studied the effects of a hospital-based health and well-being intervention programme on illness perceptions of and self-esteem in women with a diagnosis of primary breast cancer. "I loved my time at LSBU", Claire says. "I met new friends and so enjoyed the whole University experience. I found there was a lot of support for mature students and the Psychology Department staff was so friendly and generous with their time and expertise." "My first-class honours result has led to my successful application for a Clinical Academic Doctoral Fellowship (PhD) programme at Southampton University. I have just started on the 4-year programme and will continue two days a week in my cancer nursing role and three days per week on PhD research study." Claire was awarded her first class honours degree in BSc (Hons) Clinical Psychology at the university's Arts and Human Sciences graduation ceremony on Wednesday 9 October. The ceremony took place in the heritage-listed Royal Festival Hall, one of the world's elite event venues, situated in the Southbank Centre near LSBU's London campus. Find out more about Psychology.